Is there not an "info" button that lets you select what information is displayed through the HUD? 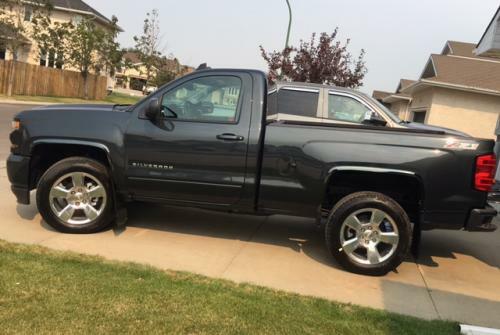 Denali Gauge Cluster Swap IN CANADA?? I just went thru the process with WAMS. I found a cluster on eBay and contacted the seller to see if he'd ship it direct to WAMS and include the order number for reference. Getting it shipped to me was a little harder. From previous experience, WAMS prefers not to ship to Canada. You could always get it shipped to a US address and then get it shipped up or go and get it yourself. Let me know if you have more questions. That description leads me to believe that listing is for just the led insert, not the entire handle. I want to send a big shout out to Chris for helping me with the logistics of getting an eBay cluster shipped to him and then up to me in Canada. His communication and understanding was awesome. I love the look of this cluster in my Regular Cab . I'm hoping that someone comes up with a kit to make the HUD look factory. I'd have no issues cutting the dash to get the module in but I'd like to make sure its looks proper when its all finished. The dl3 harness will not work. The connectors are wired differently. To get the functions the only way is to use a modified dl8 harness and get rid of the dl3 door harnesses. The functions are missing because you used the dl3 harness. To get the mirrors to function properly, you will need to replace the dl3 harness with a modified dl8 harness (or modify your old dl8 harness). All the details are in your previous post. The DL3 Harnesses are pinned different than the DL8's. You will need to purchase a modified harness or DIY kit from @pgamboa. I used the set of DL# harnesses I got with my mirrors and harvested the wires/connections I needed. 2018 Denali cluster for sale. 2015 Silverado with HUD retrofit/upgrade. I am also curious if you have pictures of the finished product? I sent you a PM with a few questions. I'm pretty sure the mounting portion of the mirror (the sail) is a different shape and won't work. That would be ideal...but with no workshop and -25 temps, not something I was willing to attempt. good point. I guess I was over thinking the 0.3mm. I might give them a try. Thanks again. I agree its not much...I'm hoping someone with more knowledge and experience would have a more concrete answer. I am not worried about clearance anywhere but the center bore. Will the smaller bore of the Rams wheel at 77.8mm fit over the hub center of the GM. It is 0.3mm larger at 78.1.